Thursday 30 October 2014 marks our fourth National Black Cat Day, Cats Protection’s annual campaign to celebrate black and black-and-white cats. Black cats are often overlooked by potential adopters and take on average a week longer to home. We’re not sure why but we don’t want to see them left waiting in the wings so invite you to join us in commending the beauty of black cats. Thousands of people backed the UK’s first ever Black Cat Awareness Day – as it was known then – on 27 October, which drew attention to the hundreds of homeless black cats in Cats Protection’s care and the apparent reluctance of people to adopt them. Fictional mascot Billy Noir-Mates was the face of the campaign, starring in his own video and donning social media profiles. The campaign’s Twitter hashtag, #CPBlackCats, was in the top 10 trends on Twitter and at one point it was the third most-talked about subject among UK users, temporarily beating Justin Bieber! The campaign also attracted support from celebrity cat-lovers including Twiggy Lawson, Samantha Fox and creator of Simon’s Cat, Simon Tofield. Black Cat Awareness Day was so successful that we decided to turn it into an annual event. In the campaign’s second year we changed the name to National Black Cat Day and really embraced the power and reach of social media. We asked our supporters to upload pictures and stories of themselves dressed as black cats and to share photos of their own real-life black cats. We also encouraged people to change their social media avatars to a specially designed black cat version. Model Lucy Pinder helped us to promote the campaign which reached nearly 330,000 people on social media. In 2013 we invited owners of black and black-and-white cats to share photos of their pets on Instagram. We received more than 2,000 entries and created a poster to showcase some of our favourites which was used as a homing campaign in a shopping centre. We also encouraged our supporters to send in funny videos of their black and black-and-white cats – Emma Wallis’ video of her bin-loving cat Rupert topped the votes. 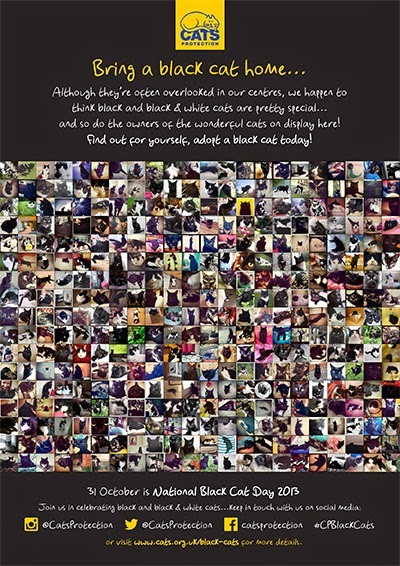 Finally, we developed a black cat download pack on our website, which contained photos, posters and a black cat mask for cat lovers to spread the word. This year we've launched a National Black Cat Day Champion competition on Facebook which invites our supporters to share their rescued black cat selfies (with stories). The winning ‘Champion’ will win a photoshoot and will become our black cat rehoming ‘poster cat’ in our homing posters and publications. You can vote by liking your favourite on our Facebook page on Wednesday and we’ll announce the winner on Thursday. We hope that our campaign can continue to prove that monochrome mogs are just as lovely as cats of other colours.